I do believe in magic: the magic of words. 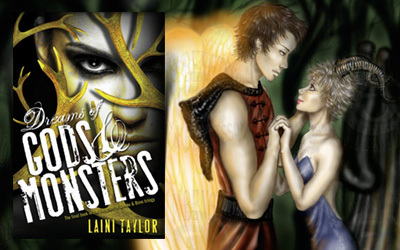 And Laini Taylor might as well have pure magic on the tip of her fingers, as that’s how enchanted I am by her story. This series is just too wonderful for words, absolutely mesmerising! And I could never recommend it enough. When I finished this story I was absolutely happy. I was locked into my own personal bubble of happiness, bursting right trough & from my heart, and it filled me with so much emotion that I can barely conceive to put into words right now. It felt like having wings – like I could reach Eretz if only I would spread them wide and let my soul soar into the sky. There will be no more desert adventures, no more flying, no more Eretz. There will be no more Karou & Akiva to cheer for, no more Zuzana & Mik to make me giggle. No more monsters to love, no more Ziri, my dear sweet Ziri with his first love that could melt even the coldest of the hearts. There will simply be.. no more. How can such an amazing world not exist, huh? How can such wonderful characters not be real, how can this story be only trapped between the pages of this book, how can I not be part of it any longer? And so my bubble broke right in front of my eyes. I cried then. For all the hours I spent reading this book that I won’t relieve for the first time; for all beauty of this story and the wonder of Laini’s world that I keep hidden deep into my heart. For all the moments I stopped breathing and the ones when my heart seemed to stop beating; for all the instances when the happiness or the despair broke me and for all the tears that threaten me through the series. For all the moments I smiled like a kid, for all the moments when I though it could never get ‘better than that’, but oh, how much better it did get! For our characters this is not the ending, they have more adventures awaiting for them, but just how cruel is it, Laini, to know ‘that‘ but not be able to follow them to the end of the world and beyond? Pretty please… Can I make a wish, can I find a portal? Or couldn’t Zuze just come and take me with her to Eretz? ‘Cuz I refuse to say goodbye, I refuse to close this book! I refuse to let it end! If only words could evanesce and I could set them free into my world, if only I could have one more moment with them all, just one to last me a lifetime.. If only…. Boy, I am drunk with this book, ain’t I?… If that’s even possible. I swear I am floating through the air, in my way to the skies of Eretz. Don’t you believe me? Just take a sip, and when you finish reading it, come back to contradict me. I dare you!… I really do. … And if someday the graphic novel will become reality.. Oh my, that will be a dream come true! ♥ Human’s reaction to angels vs “demons”. How they perceived the bodies, how the menace of the apocalypse got the best/worse of them. ♥ The change of heart when it came to monsters & angels; the painful, heart-stabbing evolution of their relationship. ♥ Akiva & Karu. Zuze & Mik, our cute samurai. ♥ The diplomacy with witch they asked ‘nicely’. ♥ But.. Why didn’t we hear more about Gabriel? (view spoiler) I was so sure he and Eliza would become a ‘thing’..
♥ If I’d die even a bit every time Laini drops a bomb, I would never see the end of this story. ♥ I’m not sure what food is good for mending hearts, but keep that close while reading. ♥ Heart-breaking.. stitching it and breaking it again, but beautiful nonetheless. ♥ Please don’t end, please don’t end, don’t you dare to ever end, you beautiful story! READING PROGRESS – mild spoilers! 53% - No, no, no, no.. no, no no.. No! Tell me you just.. didn't! NOOO!!!! you better make it 'well' again (or I'll become a samurai instead of Zuze)! 76% - Phew! I almost had a heart attack, damn it!!!! 85% - If things seem pretty well when there's still a lot of space between me and the last page, I should fear.. right?! Or can't there be a full 15% of happy endings? CREDITS: Cover image picture: Akiva And Madrigal. You can click on the other images for the sources. I ♥ your reviews so much! I am on the second one now and love it so much! I couldn’t keep from reading your thoughts on this one though, and now I am even more excited for this !! Awww! finished this one yesterday! So pretty, so amazing, so cute, so awesome!! Oh, btw, I was looking if you share a song this time because… I don’t know why, but “The things we lost in the fire” makes me think of this series… just saying! Well, now that I thought about it, I remembered one that matched my mood (it’s up in the review now). That doesn’t mean that I don’t agree with your choice, it’s a lovely song and yeah it fits too, it’s only that I am in more of a grieving mode here, LOL. I finished this yesterday and wow… It became one of my favorites!!! I can’t express how much I love this story. Ugh. I know the feeling. 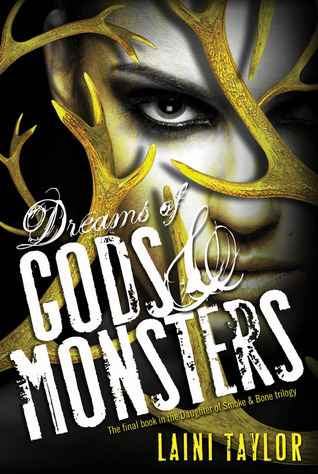 I loved this book too and the whole series – so beautiful and imaginative and original… Absolute awesomeness! Thank you dear. This series is one of my top favourites. I’ve been recommending it to some friends and they all loved it too. I was happy but also sad to see it end, because I wanted to spend so much more time with these characters!